SERGEANT SYDNEY HIBBETT was officially reported ‘Missing presumed Killed in Action, 1st. July 1916’, in the Battle for Gommecourt Wood, the first day of the Battle of the Somme. He was 22 yrs old. Members of the Hibbett Family also received messages, by word of mouth, that Sydney was missing and had been seen wounded in No Man’s Land. Their search for him began immediately but it was four years before they received news of his possible grave. In 1919, Bertie Hibbett designed a Grave Stone for his brother. It has a number of features that were eventually to appear on the official CWGC Grave Stone: Rank, Name & Number, a Cross, the Staffordshire Knot and a saying or biblical quotation at the base. Here Bertie has chosen HAVE MERCY. O LORD, UPON HIM AND LET PERPETUAL LIGHT SHINE UPON HIM. In MY MEMORIES OF THE FIRST WORLD WAR, 1967, Bertie writes movingly about first hearing his brother had died on the Battlefield. 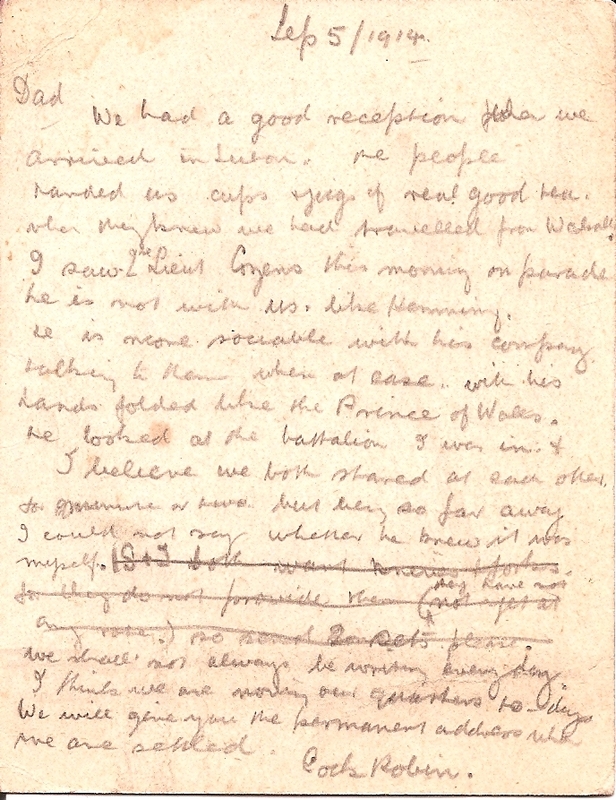 FROM HOSPITAL IN NEW BRIGHTON, Bertie wrote to anyone he could think of for news of Sydney and Venables and other friends. It must have been a great effort writing with his left hand, his right wrist badly wounded. He received sympathetic replies but no further details from Officer H.E.Bird C. QMS; J.Jones R.A.M.C and ‘Your Old Pal Ben’ still holding the Line but some miles north of Fonquevillers & Gommecourt. Dear Bert, I am pleased to hear you have got a Blighty and hope your wound will soon be healed. With regard to your brother Sid, I am extremely sorry to say that I fear the worst has happened. The last thing I can get to know of him, was that he was severely wounded, lying in No Man’s land. He was unable to speak but wrote on a piece of paper that he required a drink of water, which one of our chaps gave him, but could not stay with him. That is the last we have heard of him. I hope we may hear of him again for he was a brave man and one who did his duty, without fear or favour. If, as I fear, the worst has happened I hope you will try and soften the blow for your parents as much as possible. All papers, letters etc, I have found in pack belonging to you and your brother, I have handed over to Lance Corpl. Jones A.D. as Sid told him if anything happened he was to forward them. Your chum Venables is also missing, we can get no news of him at all. Kindest regards H.E.Bird, Chaplain QMS. Censor: J.A. Wilkinson? Enquiry Department for Wounded & Missing. To ARTHUR HIBBETT Esq. Education Offices, Walsall. We are extremely sorry to tell you that we have received a very sad report about your son from Pte W. Morris, 1107, of the same Company and Battalion, now in Spalding Hall V.A.D. Hospital, Hendon. 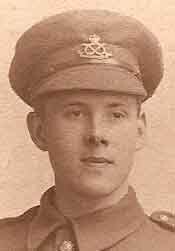 Our information states that Sgt Hibbett was wounded during the fighting at Gommecourt on 1st July and fell in No Man’s Land. When the stretcher bearers reached him later in the day he was found to have died of his injuries. Our informant was not an eye-witness of this event but was told of it by the other men in the Battalion. He adds that he knew your son well and described him as being about 5’ 9 or 10” in height and of a light complexion. We do not attach much importance to second-hand reports but we greatly fear that there can be very little hope of your son being alive, as had he been taken prisoner we think we should have received his name before now on one of the official lists from Germany. Yours faithfully, K. Robson for Earl of Lucan. ***********************************************************************IDA HIBBETT, Walsall: POSTCARD to BERTIE HIBBETT in Hospital. Nov.6th 1916. The Grammar School Flag will be flying at half mast tomorrow (Tuesday) for dear Sydney. We will send Mr. Marshall’s letter for you to read, when we send the parcel. I will write tomorrow. Love Ida. 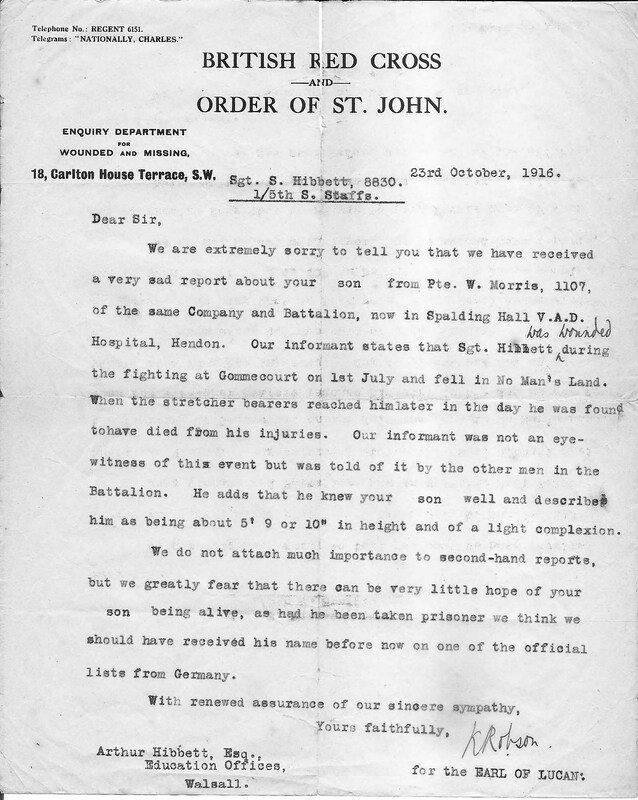 AFTER THE ARMISTICE, NOVEMBER 1919, the War Office came under immense pressure from families for information about the fate of their loved ones, especially those reported ‘Missing’. In 1919, emotions were running high when it became generally known that the bodies of those who had ‘died for King and Country ‘ would not be returned Home . IN MARCH 1919 an article appeared in Walsall’s Express & Star: ‘NOTES OF A VISIT TO THE BATTLEFIELDS OF FRANCE’ by Major H.B. 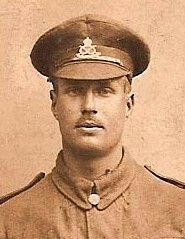 Lane, one-time Medical Officer with the 6th S. Staffordshire Regiment. PRESS CUTTINGS BOOK – dating from March 1919. 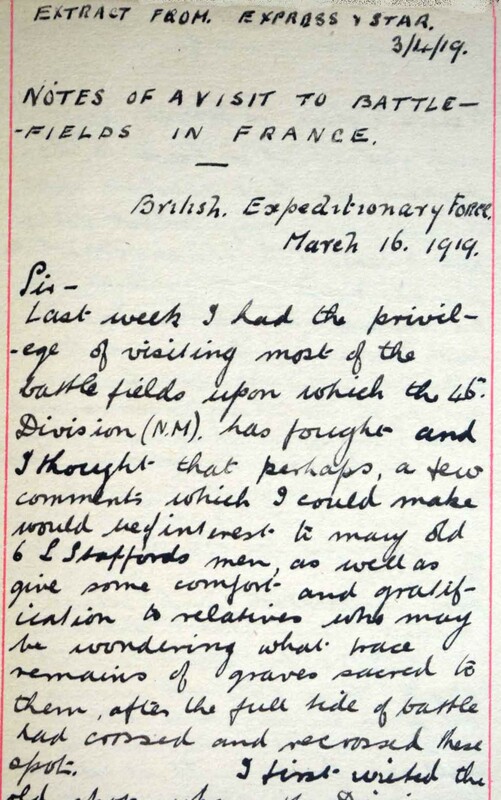 NOTES OF A VISIT TO BATTLEFIELDS IN FRANCE by H.B.Lane (Major RAMC) one time M.O. 6th S.Staffs. British Expeditionary Force. March 16.1919. Sir – Last week I had the privilege of viewing most of the Battlefields upon which the 46th DIVISION (North Midland) has fought and I thought that perhaps a few comments which I could make would be of interest to many old 6th S. Staffords men, as well as give some comfort and gratification to relatives who may be wondering what trace remains of graves sacred to them after the full tide of battle had crossed and recrossed these spots. I first visited the old spot where the Division first had the honour to take their share in combating the enemy. Bulford Camp (Cemetery) had long since been removed and had been re-erected at Aldershot Camp, the resting spot of the N. Staffords, when out of the trenches. This I believe was done before the Messines Battle in 1917. All the houses are totally destroyed, including the old Head Quarters of the 1/3 NM Field Ambulance, though oddly enough the main dressing station – the French Customs House – still stands. 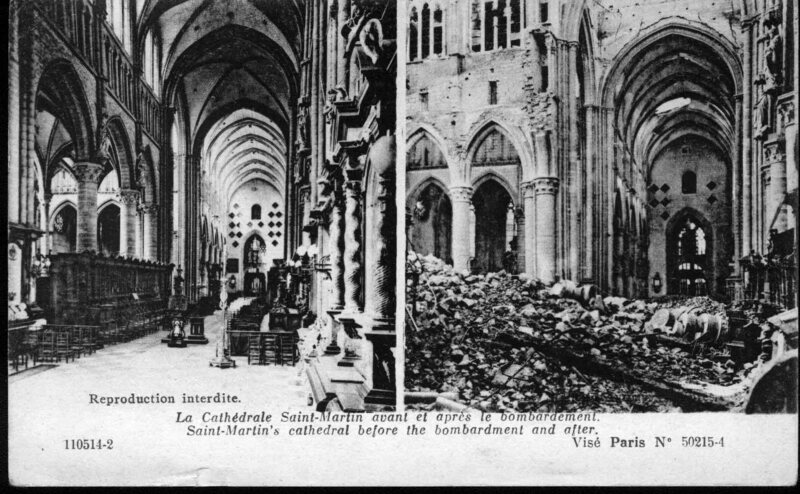 NEUVE EGLISE is totally destroyed and indeed it is hard to recognise in that desolate spot the comparatively intact village we knew (the Church & the private house on the outskirts, with the statuette in the garden and the bath house). I visited the British Cemetery, which was in a portion of the Churchyard & found it in very good order. THE GRAVES REGISTRATION UNIT are doing magnificent work both here and everywhere I went, restoring the cemeteries after battles. All the graves have been renovated, and, where needed, fresh crosses erected. WULVERGHEM was a distinct shock. There does not remain one stone in the whole area to denote that there was ever a village there. If it had not been for the cross-roads and the ruin I doubt that I should have known where the village had actually been. There are those who know, but let me assure them this or that grave stands well looked after and ready for their visit. BAILLEUL is but a shell of its former self. The only place that has any semblance to a building is the asylum, best known to both officers & men for the most excellent bathing facilities offered. From there I quickly got down to the HULLOCK area, passing slowly by the HOHENZOLLERN REDOUBT, with its poignant memories of the most awful blow that has ever been for both us comrades in arms and many homes of Walsall & Wolverhampton. The Cemetery on the plain by VERMELLES is gradually being restored to order. The other in the quarries has much to be done, having been in the hands of the Bosche for many a month, but it will be restored. Moving still further south I visited LA TARGETTE and NEUVILLE St VAAST – the scene of operation in March 1916. 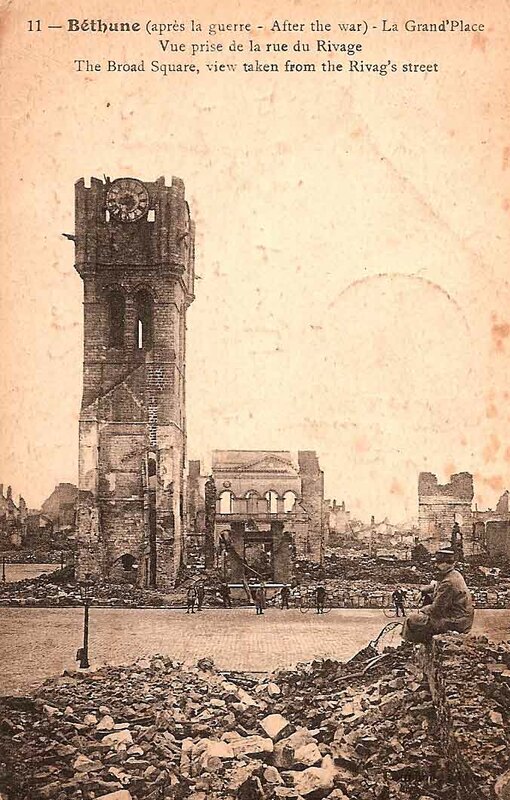 Neuville St Vaast was noted then by its state of destruction, but La Targette was a village. It now shares the same fate as Neuville St. Vaast. Behind here, between MONT St ELIOTT & ECOUVRES, is perhaps the biggest Cemetery in the Battle zone in France, at that time it held over 4.000 graves. Now there are more than double that number – a terrible & yet wonderful tribute to the self-sacrifice which has made our victory possible. At GOMMECOURT everything is as it was when the Division left it in March 1917. For Gommecourt did not come into the battle area again: – but the distressing thing is that so much time elapsed between our fight there in 1916 and the time the Bosche retired, that it was impossible, despite all efforts, to identify the remains and the graves. All of those crosses standing in NO MAN’S LAND, almost in all instances ,To an Unknown South Stafford killed in action, July 1st 1916. 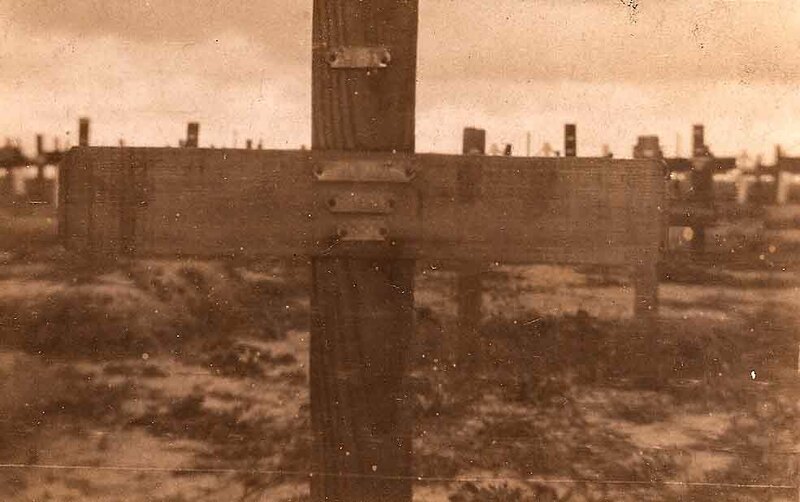 NO MAN’S LAND, CEMETERY FONQUEVILLERS: WOODEN CROSS inscribed: ” To an Unknown Sergt. S. Stafford”. Photo: Basil Hibbett 1920. There is a very nice Temporary Monument standing just in front of the old German Trenches on the side of the Gommecourt Road: To the Memory of the Officers, Warrant Officers, N.C.O.s and Men of the 46th Division who fell on July 1st 1916. A similar Monument with this inscription stands in FONQUEVILLERS CEMETERY where many more named Staffords lie buried. The Monument is a plain oak cross, with a brass tablet standing about five feet high. Our trenches are surrounded by barbed wire and are being preserved, I believe for all time, as one of the sacred spots of the War. At BELLINGLISE, the scene of our great triumphs, here is another similar monument. All these monuments are to be replaced by more substantial lasting tribute to the gallantry of those who so magnificently gave up their lives to the call of King and Country. H.B.Lane (Major RAMC ) one time M.O. C. 6th South Staffords. On 18th APRIL, 1919, almost three years after his son’s death, ARTHUR HIBBETT wrote again to the War Office. He received the following reply, dated 12th May. War Office. 12th May , 1919. 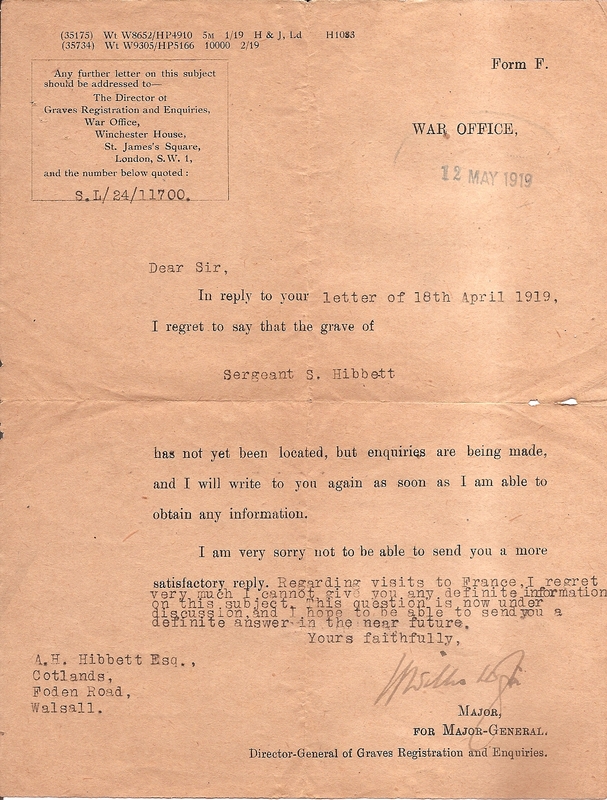 In reply to you letter of 18th April, 1919 I regret to say that the grave of Sergeant S. Hibbett has not yet been located, but enquiries are being made, and I will write to you again as soon as I am able to obtain any information. I am very sorry not to be able to send you a more satisfactory reply. Typed addition: Regarding visits to France, I regret very much I cannot give you any definite information on this subject. This question is now under discussion and I hope to be able to send you a definite answer in the near future. Yours faithfully. H. Willis – Major for Major General, Director General of Graves Registration and Enquiries. On 16th MAY, ARTHUR HIBBETT wrote yet again to the War Office and received, by return, the following acknowledgment regarding ‘this subject’. It is evident by the change of address that the War Office was overwhelmed by enquiries. War Office, London, S.W.1. 16. 5. 1919. 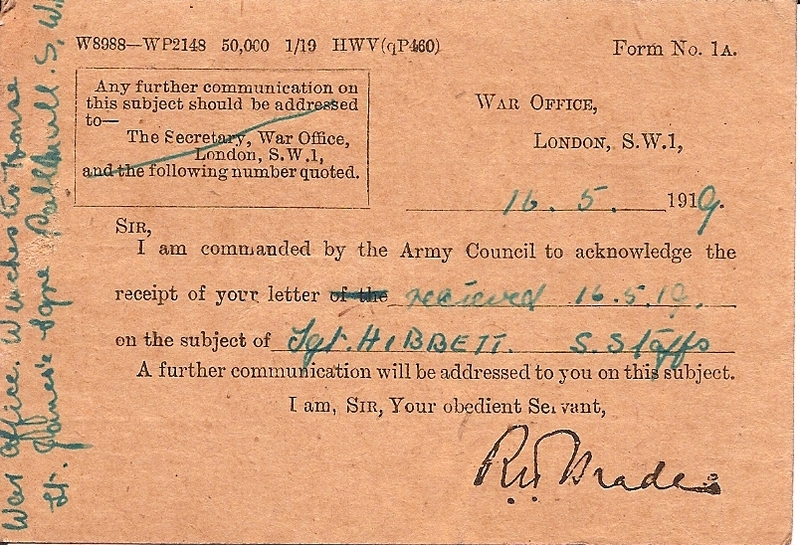 SIR, I am commanded by the Army Council to acknowledge the receipt of your letter received 16.5.1919 on the subject of Sgt. HIBBETT S.Staffs. A further communication will be addressed to you on this subject. I am, SIR, Your obedient Servant, R.N. Drades. Any further communication on this subject should be addressed to The Secretary, War Office, Winchester House, St, James Square, Pall Mall. By AUGUST 1920 SYDNEY’s GRAVE was still not found and my Uncle, BASIL HIBBETT (Lieut. Manchester Rgt) set off for France in search of his brother. BASIL HIBBETT: POSTCARD to his Mother, Mrs.A.Hibbett, Foden Road, Walsall, Angleterre. Sunday 29th August 1920. 11 am. We cycled here from Ypres yesterday & found an English hostel, St Barnabas. We are off for Loos and Arras today. Have got in touch with the graves people at Arras about Sydney & Alfred * & if the graves are there I shall find them alright. Good weather so far. Much love, Basil. NB * possibly a cousin. 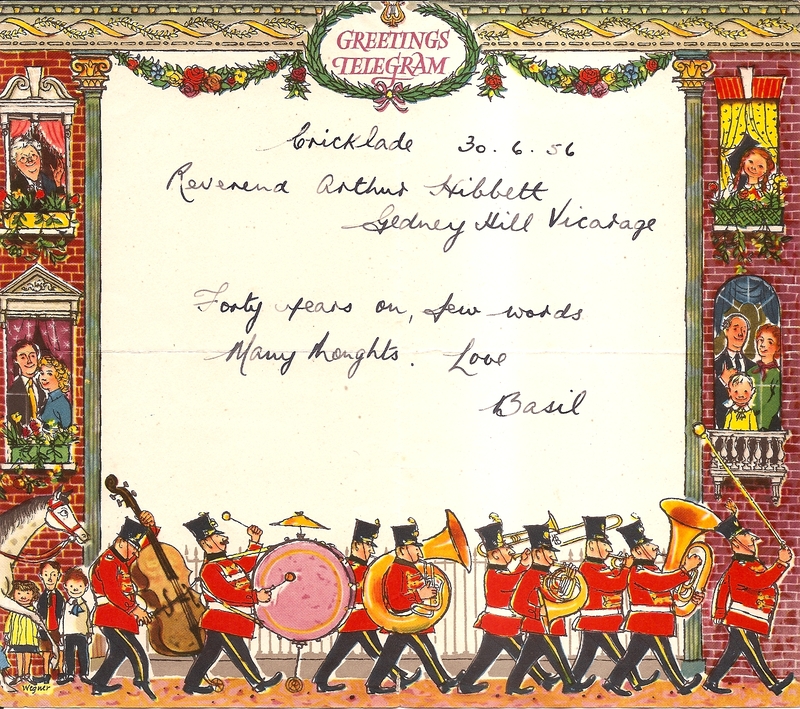 1st JULY 1916 Anniversary TELEGRAM from BASIL HIBBETT: Cricklade, 30. 6. 1956 to Reverend Arthur Hibbett, Gedney Hill Vicarage, Spalding, Lincs. Forty years on, few words. Many thoughts. Love Basil. FROM WOODEN CROSSES to GRAVE STONES – from SMALL CEMETERIES to LARGER ONES. Between 1920 and 1925 the graves of the small Cemeteries, lying within No Man’s Land at Fonquevillers, were brought together in Gommecourt Wood New Cemetery, Fonquevillers. 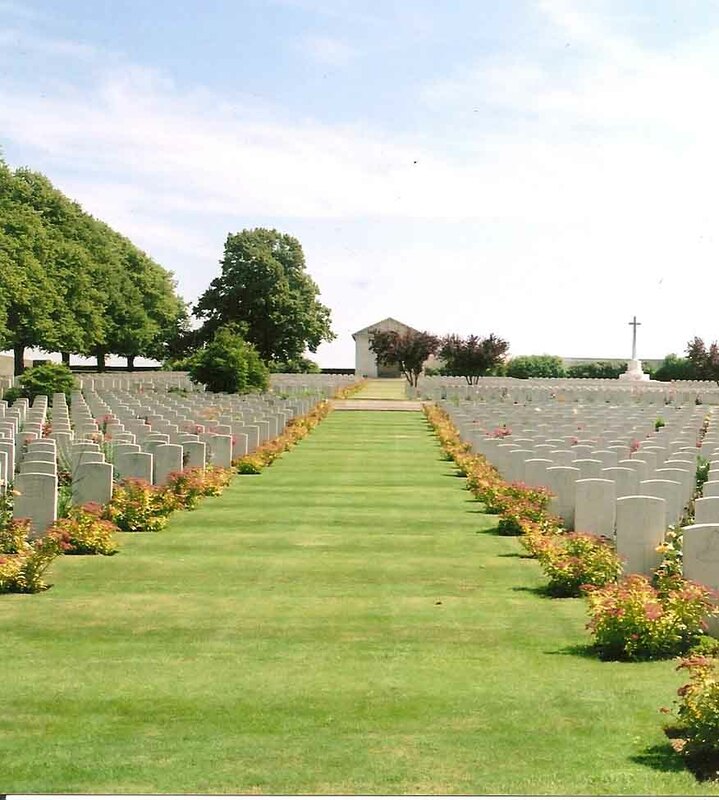 It was then that the WAR GRAVES REGISTRATION, by process of elimination, decided that the body of ‘An Unknown Sergt. South Stafford’ was most probably that of Sergt. Sydney. Hibbett 8830 1/5th. thus confirming the story that Basil had brought Home in 1920. 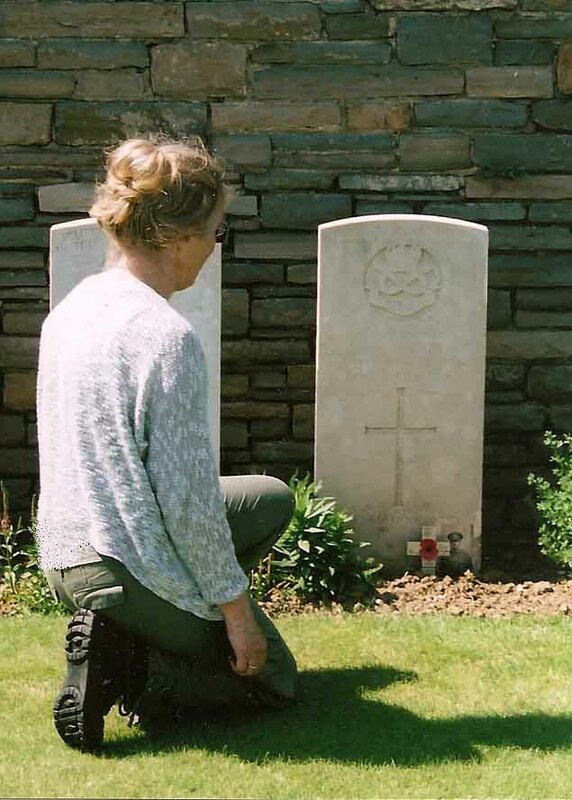 The War Graves Registration Unit contacted families to discover what saying they wished to have engraved on their loved one’s stone and what flowers they wanted planted beside the grave. SYDNEY HIBBETT was given a special CWGC GRAVE STONE with the inscription ‘BELIEVED TO BE BURIED IN THIS CEMETERY’ The biblical quotation at the base reads simply ‘Thy Will be done’. THE GRAVE OF THE UNKNOWN WARRIOR. Nov. 1920. I remember as a child my father telling me that he imagined the Unknown Soldier could be that of his brother, Sydney. 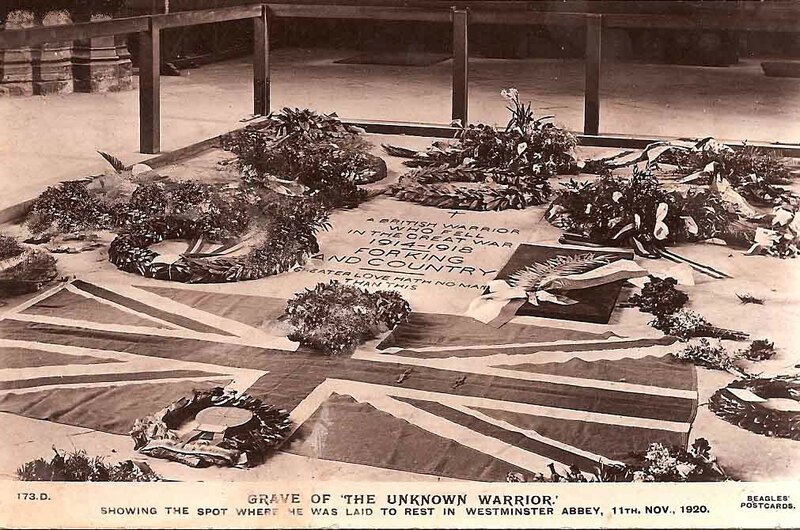 Families of the Missing took great comfort from the idea that their lost son could be buried in Westminster Abbey with full military honours .This action by the War Office was inspired and met a very human need. **********************************************************************BATTLE OF SOMME ANNIVERSARY VISIT, 1962: BASIL & BETTY HIBBETT & their son TIMOTHY: POSTCARD to The Revd A. Hibbett, South Kelsey Rectory, Lincoln, England. Posted 5.7.1962. Tim is bringing us back by car & we stopped here tonight. So I tramped the cobbled streets of Ypres once again after 45 years & heard the Last Post sounded at Menin Gate at 9.pm. Very impressive and moving. Will write more fully later. We cross via Ostend tomorrow. Basil. I first visited Gommecourt Wood New Cemetery in 2003. I took with me a photo of Sydney’s Grave taken by a kind member of the Western Front Association (South East). It showed a rose bush beside the grave which pleased me as I knew from Bertie’s letters that roses were his Mother’s favourite flowers, he found her a wild June rose to send in his last letter Home; a rose is most probably what she asked for. All the Battlefield Cemeteries I have visited are beautifully kept by the volunteer gardeners, who take a great pride in their work. My third visit to Gommecourt Wood New Cemetery was on 1st July 2016, with my sister Rosamund Hibbett, when we were glad to share our father’s drawings of Fonquevillers Church (& its famous sign‘To Berlin. Up Traffic only’) with many other visitors. Since creating this website I have been much moved by the knowledge that people, other than the Hibbett Family, have been visiting my Uncle Sydney’s Grave. My grateful thanks to Paul Hughes of QMS, Walsall who visits the grave ‘regularly’ and to John Vallance & other researchers in Staffordshire and Bedfordshire who have taken an interest in Sydney Hibbett’s story. 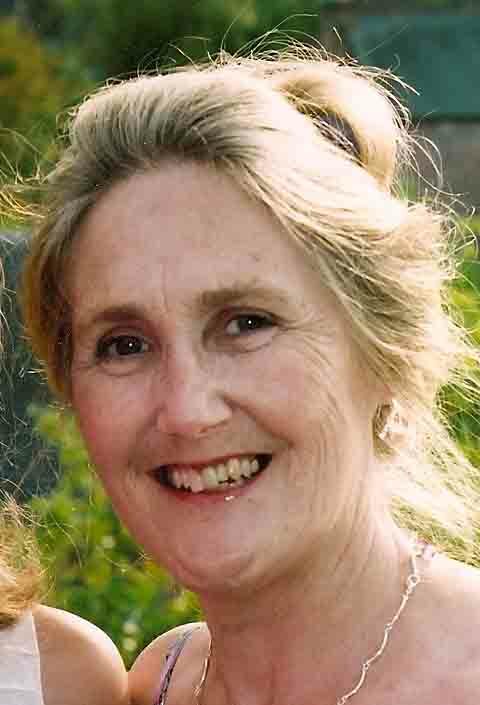 Elizabeth Webb. 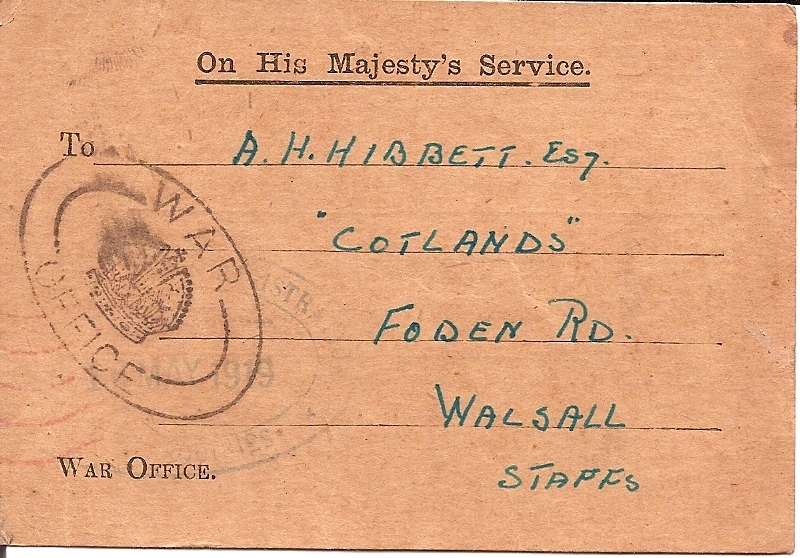 PTE BERTIE HIBBETT in LUTON, POSTCARD to his Father at 95, Foden Road, Walsall. We had a good reception when we arrived in Luton, the people handed us cups & jugs of real good tea when they knew we had travelled from Walsall. I saw 2nd Lieut. Cozens this morning on parade. He is not with us. Like Hemming, he is more sociable with his Company, talking with them at ease, with his hands folded like the Prince of Wales. He looked at the Battalion I was in & I believe we both stared at each other for a minute or two, but being so far away I could not say whether he knew it was myself. Syd and I both want knives & forks for they do not provide them (not yet at any rate) so send two sets please. (Crossed out with ‘They have now’ above ). We shall not be writing everyday. I think we are moving our quarters today. We will give the permanent address when we are settled. Note to Mother on the back of Postcard: Dear Mother, Syd is just writing to you and will send them on tomorrow night..
PTE BERTIE HIBBETT: POSTCARD to his Sister IDA nicknamed ‘Champion’. IDA HIBBETT. 27 in 1914. Syd & I are now sitting under an oak tree, which are common around here (lovely estate full of them just near). We have four or five little Cockney lads round us, they have been bird catching & have shown us the cage they catch them in. Lovely afternoon. Capt. Lees has not had orders referring to the O.T.C. for this afternoon’s occupation. The Terriers have gone off on rifle inspection. 1/2 mile of soldiers all in fours marched about 6 miles & back for entrenching. You should have seen the sight. Officers on H orseback. General Sir Stewart Whortley inspected us, ruddy war worn face he had. Asked Syd where we had come from. Guessed we were fine fellows of the O.T.C. Songs for you to sing & play at home. Another version of John B’s napsack. 20,000 troops here. More soldiers than civilians. Oh its jolly so far. Ta-ra. Bert. 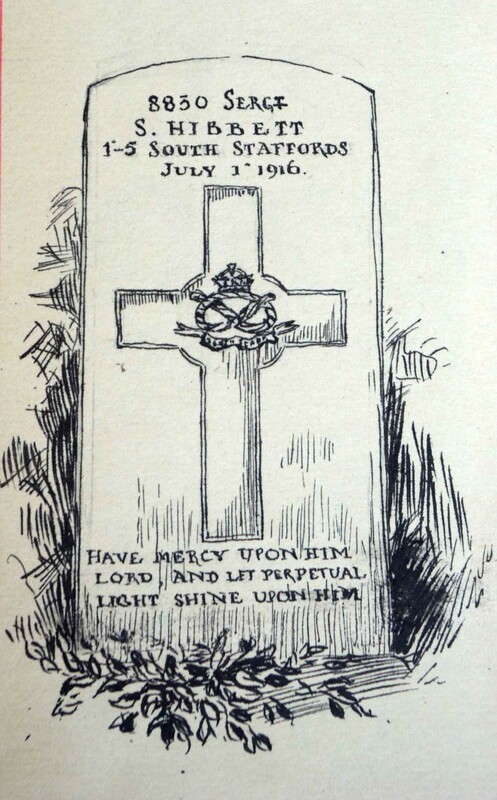 PTE BERTIE HIBBETT: POSTCARD to his youngest Brother, BASIL, nicknamed ‘Dodger’ 16 in 1914. Sept 5th/ 1914 about 5.45 pm. It’s Tommy’s life to a T singing and talking all night. Four kind friends let us sleep in their bunks but I had to sleep on the floor with a great coat & blanket. I slept in my trousers. ‘Reveille’ was grand., but unique sensation. That flash lamp would have been very useful & will be while we are in England – if you care to send it. 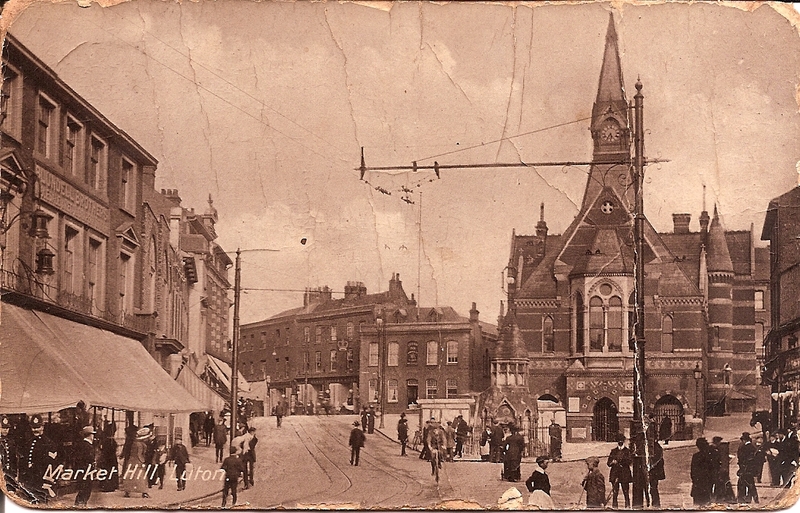 NEXT POST: 9th October 1914`: Training in Luton. NEXT PAGE to be published: Walsall Express & Star 3/4/ 1919. Visit to Battlefields in France. H.B.Lane (Major RAMC) onetime M.O. 6th S.Staffords. Still Marching : Sponsored Walk on his 74th Birthday. AHH. 1969. MY MEMORIES OF THE FIRST WORLD WAR. The Revd Arthur Hubert Hibbett. 1967. ‘ My elder brother, Sydney, and I decided to enlist with the Territorials, 1/5th South Staffordshire Regiment, rather than wait to be conscripted into Kitchener’s Army. On the morning of September 4th 1914 a column of young men, all in mufti, marching four abreast, passed the Town Hall in Walsall, en route for the Station and training in Luton, Bedfordshire. The tallest QMS boys, including my brother, Sydney, were in the front row; I was in the second row, behind my brother (1). NB. 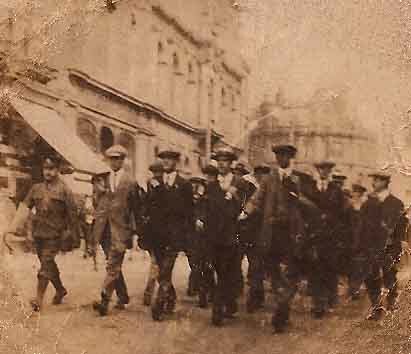 The QMS Old Boys Company are marching to the Station down Bridge Street, in this photograph. Sydney is marching next to the uniformed soldier (left), with Bertie just visible behind him. Does anyone know the name of the soldier and the other three boys in the front row? – perhaps even the name of the Art Master? 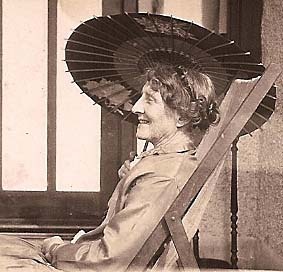 Sydney Hibbett was at QMS from 1908 -1911. 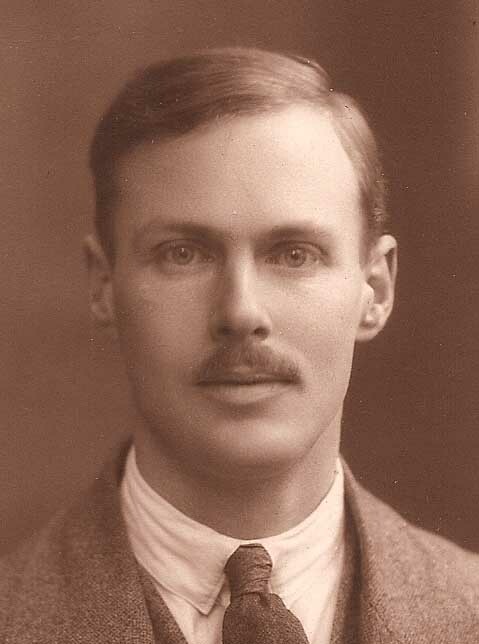 He won the Blythe Shooting Prize in 1911 and passed both Junior and Senior Oxford Examinations with Div. I. Pass . He was apprenticed to the Old Park Works, Wednesbury. Bertie Hibbett was at QMS from 1910 – 1911, the last year of his schooling before being apprenticed as a Mining Surveyor in Walsall. He joined his brother in the School’s Cadet OTC. Both boys had been educated previously at the Blue Coat Elementary School in Walsall. SAFE ARRIVAL IN LUTON, BEDFORDSHIRE. Pte BERTIE HIBBETT 8832 ‘ A’ Company 1/5th Bn. S. Staffordshire Regiment . POSTCARD to his Mother at 95, Foden Rd, Walsall. Arrived safe & sound – queer sensation but comfortable journey & good chums here. Nothing but soldiers – soldiers – soldiers! Seen F. Hemming (1)– came to our digs & also saw 3 ptes salute – and Sydney. Oh it’s grand so far, but I wish I had come in my best boots. These give me footsore, but I have stuck those pads in (2). We shall both look after ourselves carefully. Syd will give you our address in a day or two, but cannot tell you yet for certain. With love to Father & the rest. Bertie. PS. Tell Dodger (3) to practice shooting. See Sheffreys (4) there’s a notice up by the shop. Tell Ida we sang ‘Glory Alleluia’ in Luton! 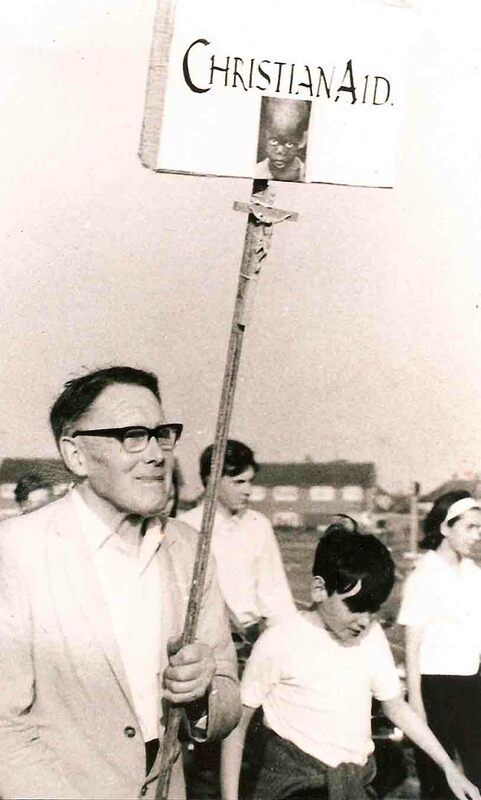 NB (1) F. Hemming was one of his father’s teachers in Walsall. (2) Bertie was plagued by ill-fitting boots and sore feet from the very beginning. (3) ‘Dodger’ – a family nickname for Basil. (4) Was ‘Sheffreys’ a gun-shop? SOLDIERS – SOLDIERS – SOLDIERS ! QUEEN MARY’S GRAMMAR SCHOOL MAGAZINE for DECEMBER 1914 lists some 170 Old Boys and Masters who Volunteered for the War; many of them would have arrived in Luton with Pte Bertie on 4th September,1914 – little more than three weeks after the Headmaster had sent his Recruitment Postcard. ‘Surely this must have been the thought which animated so many of our Old Boys and Masters when they threw up everything in which they were engaged, so that they might respond to their country’s call. We of Queen Mary’s are very proud of those whose names are given below, and, when this war is over, we intend to inscribe their names on an honours board in the Big Schoolroom as those of men whom the Old School is delighted to honour. QUEEN MARY’S CLUB SHIELD. The Revd. 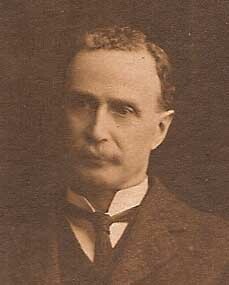 A.H.Hibbett became a Life Member on 4th March 1926. The Shield. shows the red & white Tudor Rose, symbol of Henry VIII , impaled with a sheaf of arrows, symbol of Katherine of Aragon..The Certificate signed by E.N.Marshall, is on the back. Oil on wood. AHH. 1926. QMS OLD BOYS , OFFICERS & MEN serving in 1/5th SOUTH STAFFORDSHIRE REGIMENT listed in the QMS Magazine. (Names in bold are those frequently mentioned in Pte Bertie Hibbett’s Letters.). OFFICERS: Capt. F.L.Overend; Capt.W.Wistance; 2nd Lieut J.N.H. Smith. NON-COMMSSIONED OFFICERS: Colour Sergeant M. Somerfield; Sergt H. Allen; Sergt H.W. Harriman; Sergt C. Wilkes; Corpl. H.C.L.Hartley; Corpl. W.Williams. PRIVATES: B.W.Bailey; F.J.Bailey; L.J.Bailey; R.W.Ball; I.Boulton; A.E.Brown; E.Beebee; W.L.N.Cope; J.G.Allsopp; W.H.Cliffe; H.V.Crooke; R.Canby; C.H.Denham; B.B. Davis; G.E.Bradbury; E.V.Evans; J.Foster; T.E.Fenton; S.Hattin; G.Hewitt; S. Davis; C.Hacket; A.C.Harrison; S.Hibbett; A.H. Hibbett; C. Hinde; H.Hinde; C.H.Harriman; H.W.Houghton; A.O.Jones; C.H.B. Hammonds; E.Joberns; A.E.Machin; A.V.Shaw; J.F.Price; W.Price; S.J.Parkes; W.A.Payne; J.A Shipley; S.T. Richards; C.A.Thompson; C.V.Taylor; A.H.Wilkins; F.H. Wootton; A.C.W.Lyon; J.S.Smith; F.Lawton; F.Cotterell; H.Spencer. 5th S.Staffs Battery RFA: H.H.Lawley; W.E.C.Pullen; F.J.Gee; E.G.Birch; W.F.Hudson. NEXT POST: 5th Sept 1914: Training in Luton.